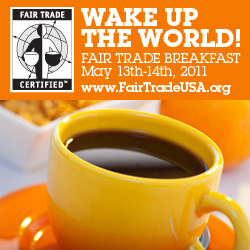 May 14 is World Fair Trade Day: Wake Up the World! Been wondering what the term Fair Trade Certified means when it comes to food? If you have a general idea that it may be a “good thing” but aren’t sure where to find these foods, or how to use them, your day is coming. You can join Fair Trade supporters from around the world to celebrate World Fair Trade Day with a Fair Trade Breakfast on Saturday, May 14. It’s easy to get involved and take action in support of social, economic and environmental sustainability for farmers and workers around the world. The Fair Trade USA website is full of creative ideas if you’d like to raise awareness about Fair Trade while having fun and enjoying good food in the process. You can also join the Facebook page for Fair Trade Certified and exchange ideas there. One suggestion is to prepare a Fair Trade Breakfast for your family and friends. Take a moment to educate guests about Fair Trade by identifying the Fair Trade Certified ingredients used for each dish. Or enjoy a Fair Trade breakfast on your own. It can be as simple as making a cup of Fair Trade Certified coffee or tea and eating a Fair Trade Certified banana. When you see the Fair Trade Certified mark on food and other goods, you can be assured that the producers in developing countries have received a fair price for their products that allows them to make investments into improving their local community and infrastructure. With Fair Trade Certified ingredients ranging from pasta and spices to cocoa and tea, you now have many options for making a positive contribution to the lives of producers, sustaining the earth and the global ecomomy. And of course you can use Fair Trade Certified spices to enhance your dishes. You can prepare entire Fair Trade meals for any time of day. As you plan a meal, simply check through your list of ingredients to see which ones may be offered in a Fair Trade version. For main dishes, you might go with Fair Trade pastas, vegetables and spices. Use Fair Trade avocadoes, tomatoes, or other veggies for salads or side dishes. You can find many hot drinks and beverages in the Fair Trade range. Enhance your meal with home-baked breads, cookies and desserts using Fair Trade fruits. Those Fair Trade bananas mentioned above can now be found at almost any food store these days. They were one of the original fruits to become widely certified; now the products available are much broader. You can discover your own creative fruit combinations. Your support of Fair Trade doesn’t have to end with food items. More and more Fair Trade kitchen and table items are becoming available: place mats, tableware, napkins, serving dishes, etc. Explore the possibilities — many stores will be offering suggestions and specials for World Fair Trade Day, so check with your local natural and organic retailer. Please let us know if you have any plans for this day, or if you have any favorite Fair Trade Certified foods or products. This entry was posted in At the source, In the kitchen, In the news, Natural health, Sustainability and tagged 2011, cooking, Facebook, Fair Trade, food, May 14, organics, spices, World Fair Trade Day by Cayenne Room. Bookmark the permalink.